The puppy will lose his milk teeth at about 3 - 6 months of age. His teething can affect the ears. The ears should be erect by the time the puppy reaches 6 or 7 months of age, but they can be as early as 3 months or as late as 8 months depending on the individual pup. Occasionally the ears can be erect then go down - this is only due to teething & they should be all right again when all the teeth are through. Give the puppy plenty of bones to chew & tear at as this helps the ear muscles & teeth. Dental Faults: " In modern times the GSD has tended to have good dentition, especially when compared with many other breeds. The most serious fault is an undershot jaw, which occurs when the lower incisors protrude in front of the upper. This is exceedingly rare in the GSD (in forty years, I have only ever seen one case), as is wry (twisted) mouth. 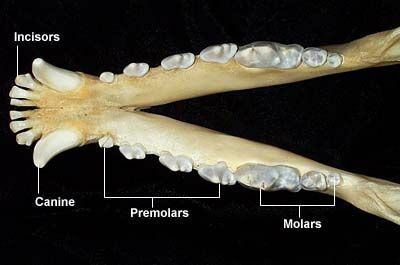 A more common failing is an overshot bite, when the upper incisors are ahead of , and not touching the lower." Quoted from Pet Owner's Guide to the Shepherd Dog by Dr Malcolm Willis.